Retrogradation refers to a period of time during which a planet, ‘as seen against the backdrop of the stars from the Earth’, appears to move from East to West, as opposed to West to East. In other words, the planet appears to be moving contrary to how it normally moves. Of course that does not truly happen in ‘real’ terms and is a phenomenon that can only happen when a planet is viewed from another planet, as opposed to viewing the orbits of our planets from our star, the Sun. But since a large percentage of astrological practise concerns itself with human concerns, the solar system is viewed from the Earth and is called geo-centric astrology. Moreover, astrology concerns itself with divining meaning from the stars, as opposed to concerning itself with the astro-physics of the stars, something we leave to the astronomers to focus on. Therefore, the apparent reversing of direction of a planet is considered important, even if it is a regular and normal feature of our skies. Since Mercury is very close to the Sun and reflects our perception of reality and our personal and collective mind, its Retrogradation heralds a time wherein our/ your ‘Mind is turned inwards towards its own Light’ and therefore marks a time of mental reflection. This contrasts the retrograde cycles of Venus and Mars, which outline emotional (Venus) and physical (Mars) reflection. The only ‘planets’ in our inner solar system that do not turn back on themselves is our Masculine and Feminine Lights (the Sun and Moon). Mercury’s reverse motion takes place every 116 days or so. Alternating in intervals between two different types of conjunction of 6 and 10 weeks respectively, Mercury makes his greatest elongation above the horizon in the Western evening sky about a week before turning retrograde. As he disappears into the beams of the Sun, disappearing from view, Mercury eventually passes over the face of the Sun (or at very least returns to the same zodiacal degree of the Sun) synergising with it as it forms an inferior conjunction. The replenishment that naturally takes place when anyone takes time for themselves arises when Mercury re-joins the Sun and fuses with the Light Source at the mid-point of the retrograde cycle. The fusion of these two planetary archetypes symbolises the replenishment, renewal and the ultimate re-birthing of Mind, which is really what is at the heart of this cycle. Mercury then moves ahead of the Sun and eventually makes his first visual appearance (heliacal rising) in the Eastern morning sky. This is followed by another turn of direction (this time direct), and as his apparent velocity matches that of the Sun some days after this turning Mercury is once again at his furthest distance from the Sun. This is when he appears at his highest point above the horizon in the morning skies. In psycho-spiritual terms it refers to a time when your spiritual mind is detached from all mental things and waits in silent faith for its own Light to be replenished by the Light. During this sort of communication, your soul seems to become one with the Source and in turn your Mind becoming more and more itself. As your Mind ‘feels’ more internalised and less eager to engage in frenetic busyness, this time has become synonymous with a more reflective mental time. In the same way that it makes sense to take a reflective break every couple of hours so your mind and concentration can remain sharp, after all it is impossible to mentally keep going without an occasional pause, the Mercurial Retrograde Period is a time within our collective thought process wherein our minds are naturally slowed, internalised and therefore more reflective and imaginative. Yet a Mercurial Retrograde time is not about spending the entire time daydreaming and meditating either! 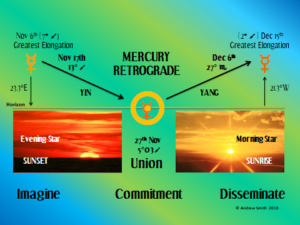 There are two differing processes at work during this cycle, all hinging around the alignment, or conjunction, of Mercury with the Sun (marking a time when a replenishment of your mind takes place). In the weeks leading up to this fertilization, your mind is increasingly reflective and in release mode, as you prepare to let go any ideals that no longer serve you, or as you start to more actively review the quality of, and relationship to that part of, your consciousness related to the sign that Mercury will retrograde within. As Mercury turns Retrograde, this process intensifies, or at very least becomes a more pressing theme. As Mercury moves in the Vault of Light and is swallowed up by the Light of the Sun, a week or so before this conjunction, your mind is literally washed of all past themes associated with the sign of the union. This is an ideal time for release work and also for starting to envision the ideal that you want to plant as Sol and Mercurius unite. The time after this union starts a two month phase of mental proactivity as that ideal you have set yourself gradually grows in your life, leading to its blossoming as Mercury and the Sun reunite, but this time in a more proactive and yang manner during what is called a Superior Conjunction. This second alignment is not very commonly written about within astrology, yet it is a time when the implications of the ideal planted during the Sol-Mercury union during the Retrograde, is realised. For a period of about a week after the Union, Mercury is still moving across the face of the Sun and is therefore largely unconscious. Yet a feeling of dynamism has started to infiltrate your consciousness, as you can ‘sense’ a shift in awareness and perception. However, seeing concrete manifestations of this new ideal is not likely, as you are refining the ideal and preparing to launch it. As Mercury stations and moves Direct, this is the time to go for it and having embodied the new thought, to start to live it, demonstrating it and being it! When Mercury reaches as far above the Sun as he possibly can, around the Maximum elongation stage of the cycle, that is when you can clearly see how well the processing, refining, healing and releasing that you did during the retrograde time has been for you! Finally, not all retrograde cycles are going to resonate with you and you may not take note of them unless you happen to be born with ‘planets’ within the range of Mercury’s loll. Only then will you feel it more keenly, though it is likely if you are born during Mercury a retrograde stage or Mercury is retrograde by progression, you may also feel this particular type of retrograde more acutely. To understand its impact on your life, you can book a session with an astrologer who will guide you on a personal journey of your personal retrogradations!